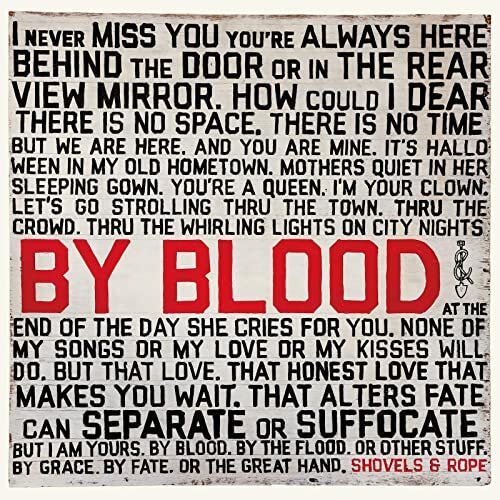 Shovels & Rope’s fifth album proper opens with a declaration, “I’ve got the taste of blood in my mouth, and I’m comin’ out!” set amidst a cacophony of buzzsaw calliope sound. It’s a fitting introduction to this noisy, excellent rock and roll record. Where 2016’s Little Seeds was colored by tragedy and loss both personal and cultural, By Blood shakes free of the tenor of our times to celebrate a collection of individuals just making it on their own terms and without apology. Meanwhile, the couple seem to revisit Richard and Linda Thompson’s classic song of dissolution “Walking on a Wire” with their own version of stubborn commitment amidst mutual imperfections on “The Wire”: “I won’t fail you when I walk out on a wire”, they sing in unison. Shovels & Rope shift gears to slower, acoustic numbers with “C’mon Utah!”, a paean to a faithful donkey named for the Mormon state, and “Carry Me Home”, with its raw gospel overtones. “Carry me home,” they sing, “I’m no good when I’m alone” in voices of shredded vocal chords. Much of their passionate singing on this record is at the furthest register of emotion, nakedly raw, on the absolute edge, unmusical and all the more powerful for it. It’s got to hurt recreating this sounds on the road every night. Additionally and successfully, they update some old folk/blues tropes with the modern murder ballad “Polly” and “Hammer”, a neo-work song set to the loose drumming of a hundred pounding hammers. By Blood is a great rock and roll record that flies by in under 40 minutes. There’s not a wasted note here. The album closes with one of those songs that Trent and Hearst have, over their past several records, made their stock in trade: the stop you in your tracks, plain-spoken confrontation with life and its fragility song. Little Seeds had it with “This Ride” and here it’s the titular “By Blood”. Written for their daughter, it is Trent’s promise of unending love and protection. When he sings “There is no space. There is no time. But we are here. And you are mine.” there is little I can think of that more succinctly or simply encapsulates the totality of parenthood, of how it consumes one completely and how space and time revolve simply around that bond and responsibility to another being. It’s true, like the whole of this record. It sticks.